Amazingly, the event, which has grown five-fold since its inception, once again drew participants from not only all around Europe, but from all over the world, including New Zealand, Hong Kong and the United States. As in past years, the regatta began with an “assembly challenge,” in which Grégory Prelat and Mélanie Vial set a new doublehanded inflation and assembly world record of 6 minutes 28 second (Gilles Bajolet took the solo win with a time of just under 11 minutes). After that came racing on the water for sailors representing a wide range of abilities and ages, including plenty of youngsters. 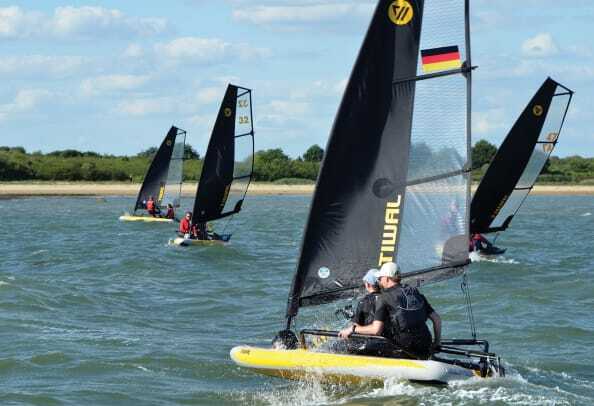 “For this 4th edition, we wanted to include the children more and offer them their mini competition,” noted the boat’s designer, Marion Excoffon. In end it was Jérôme Vici winning the singlehanded division, Michel and Alix Luong taking the doublehanded win, and Marine and Salomé Giblet coming out on top in the kid’s division. For more on this nifty little boat, visit tiwal.com/us.